Thank you to Adafruit for bringing my attention to this! 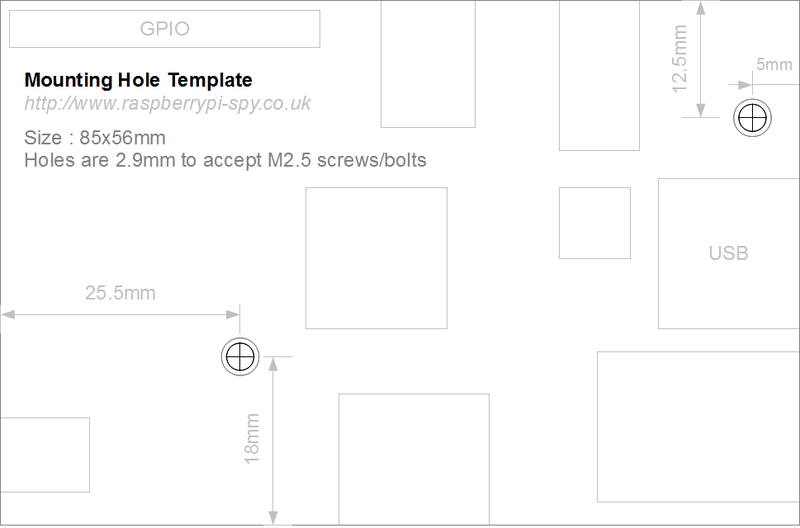 Raspberry Pi Spy has created a handy little template of the v2 Raspberry Pi, complete with mounting holes and the location of ports and other components, for you to use in your projects. Case designers and people wanting to mount the Pi securely for robotics and other projects that move around a lot will find this particularly helpful. For print, ensure that the image is sized as a 85x56mm rectangle. Click to enlarge. 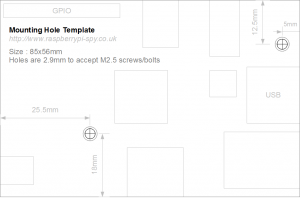 Visit the most excellent Raspberry Pi Spy for printable PDFs of this template (where the image is pre-sized for you) and discussion of what size screws you’ll need for those holes, along with much more Raspberry Pi goodness. A word of warning: Pete Lomas always asks me not to refer to the holes, which are there to aid the robots in the production process, as mounting holes. (Don’t look at the title, Pete.) This is because enthusiastic screwdriver wranglers can compress and fatally crush the PCB by tightening screws too firmly. If you screw your board to something, you’re doing so at your own risk! Are the ‘not-mounting holes’ different from mounting holes you can find on the motherboard of a PC in any way? Are the materials used for computers also usable for the Pi or are there things we should take into consideration? How about upgrading the holes to proper mounting holes? Or is that more complex than one might expect? To prevent damage why not have spring loaded screws, with rubber washers? Also nylon screws exist. Not only they are less probable to damage the PCB if overtighened, they are also not conductive. I would hope that case makers include some additional standoffs. Two points create a pivot line that pushing and pulling cables and connectors would cause the board to pivot about. Without a 3rd bolt not on that line, the board would twist about those two points with only the bolt head to resist the twist which bolt heads doesn’t do well. The board could get damage more from that than over tightening. To prevent crushing components a bunch of places are selling these 99c support bars that can go between the pi and the case or the pi and flat surfaces. There is one more thing that really needs to be added to this template – the X and Y dimensions from the “upper left” corner to the center of the closest GPIO pin. This is crucial to get the GPIO header aligned correctly with the mounting holes on any circuit board project. So…Liz, Eben, what’s the OFFICIAL values for THOSE numbers, please? If there is risk of crushing the layers of the board, why not put copper circles on each layer so that you can not crush the empty space? I would hope there are no internal traces running under the circle where they could be damaged. And I’m sure this next comment will make many mad, but it’s kind of dumb to not put mounting screw holes in the board if at all possible. Even little #2 (~1mm) screw holes. Obviously I haven’t grabbed the schematic and tried to design a circuit board this small, place all the components, and route everything with different size screw holes but there are usually ways to sneak in a few small screws if you reduce the size of the screw far enough. Even something as simple as notches in the four corners, a space where you normally try not to route any traces or place components. #2 screws take up an approximate .156 inch diameter circle, less if you just knock out the corner since part of the circle can hang off the edge. Please. Better a vectorized version. It would be nice if the Case builders provided grommets with solid interior and screws that fit so the PI would really float and not be crushed. If you want to use those holes as mounting holes without fear of damage to the board, use nylon standoffs. They have lugs that squeeze together as you push them through the hole and then they spring apart once they are through, securing the board in place. without exerting any pressure on it. They can be removed by squeezing the lugs together with a pair of narrow pliers. As previously mentioned, really need the dimension to go to the GPIO pin 1, not the edge of the board. This is the only way to reliably create a mating daughter PCB. It is extremely frustrating trying to get this information. Can anyone provide these dimensions? Pre-Christmas T-shirt sale! Get 20% off.